Email is the bane of many people's lives. Not because it's inherently bad, but because inboxes tend to get overwhelmingly filled in a never-ending battle of communication. I used to be in that camp - it seemed no matter how often I checked my email, I could never get ahead of the game. Today is much different. 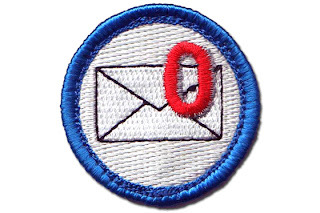 My personal email inbox rarely gets above 10 and most days finishes at 0. My work email inbox isn't as clean, usually hovering around 10-15 emails, peaking around 25 and reaching 0 once a month. Often when I share this stat, most people ask how I do it, and I thought I'd share my response. It's a 3-prong approach that works well for me. I stumbled across this trick when I did my media fast inspired by the 4-hour work week. I used to have my email open all the time. You'd think that would help, but it's actually counter productive. Here's what would happen: I would flip to my email, look for 2 seconds, and flip away. I'd flip back, look for 30 seconds to read something and then flip away. I was never actually focused on my email long enough to digest and respond properly. As a result, I really only gave myself time to quickly read the email and then "come back later" to respond. My work email uses Outlook and every time I got a pop-up notification I would click on it, read it, and decide and needed to do something about it later... or never in reality. Here's what I do now: First, I turned off all email notifications (desktop, phone, etc). I even shut down my email programs/sites so there's a slight barrier to just quickly looking. When I first started, I would set a timer and dedicate 15-30 minutes, only twice a day to checking email. I had to do that for a whole week. First, knowing I had limited time encouraged me to focus on replying. Second, it confirmed that I really don't have to be up to the second on email. Now that my email is under control, I spend at most 5 minutes checking, which I do about every other hour. That's enough time to digest/reply to any new email. OK. Stop for half a second and realize that what I just shared is HUGE. Turn off all email notifications so you're not distracted to quickly check. Then, when YOU decide to check, commit to spending more than 30 seconds. Then close it down and go on with your life. Most people make this mistake. The don't archive/delete an email because there's something that needs to be done. OK. I get that, so put it where it belongs: on a task list. I use Remember The Milk (multiple lists, mobile access, notes), but there are lots of good options. Move your task over to the proper place. If you really must keep it in one place, create a new folder called ".Task" (or ".Todo") - notice the ". "; that will push the folder to the top of your list. Now, actually completing tasks... that's a different problem, but the point is now that email is out of your inbox. Archive it and you can look it up later if needed to complete the task. For advice on completing your new burgeoning task list, recommend reading Getting Things Done by David Allen. I incorporate about 75% of his recommendations (BTW, one secret is to simplify your life and do less things, that'll also reduce stress too - a double bonus.). Sweet. You're now being more efficient during your email checking time. You're also taking the appropriate action during that time: replying/archiving/deleting. Now it's time to lessen the inflow. There are, in general, 3 types of email: Personal email that you actually read/respond to, newsletters you signed up for, and spam. Personal email. There's not much you can do here other than becoming less involved (which isn't the worst choice, really). In fact, this is the point of email in my opinion. You want to reduce everything down to this so that you can communicate effectively with these people. Newsletters: We all have these. At one time we thought we'd want to read this, but we never seem to have time anymore. BUT WAIT! There might be something SUPER important in there. Here's my advice: unsubscribe. There's a link at the bottom of every email giving you the opportunity - do it. You can always re-subscribe later if it genuinely leaves a void in your life. That's what I did. It was magical. BUT WAIT! There is 1 or 2 that I'd actually like to keep. Fine, and I suggest instead that you follow them on Facebook/Twitter or subscribe to their blog's RSS feed. Trust me, if it's good content, they'll be sharing it as often as possible. That's what I do - all product/news items are in my RSS Reader. If they don't have this, try turning the email into an RSS feed with a tool like Emails to RSS Forwarding. Set up a rule to automatically forward and archive the email. Spam: I hate these emails because if you "unsubscribe" they just capture your email and sell it to hundreds of others. Instead, flag as spam and let it die there. I actually check/purge my spam folder once a day, but you don't have to. Sometimes I find a newsletter hidden in there that I can unsubscribe from. This last one is more critical to personal email than work, but I still have a couple rules set up in my work inbox to delete auto-generated emails. Most of the time I just delete them without reading (I really don't need a top HP news digest each week. The HP twitter feed gives me that and more). So that's it. My 3 step process to reducing email overload: check less frequently for longer periods of time (take it out of your multi-tasking circuit), create a separate task list (and manage that properly), and reduce the overall inflow. As one more proof point: I helped Jessi apply these steps and she too has regained control of her personal inbox. Shed used to have hundreds of emails and now at most has 50, and often less than 20. None of these steps are hard, it just takes discipline. Decide that you're in control of your email and only check when you have time. If it time sensitive, they'll call/IM you.